The Number One URL rate, website value calculator and Domain Name Value appraisal tool that will allow you to collect vital information about your domain and website worth from various sources and make it available to the users PLUS 100% FREE Search Engine Submission to more than 220 Major Search Engines! Before you buy any domain or website, always the best idea is to investigate the potential of the domain name or website. Please visit our blog for more information regarding Website Valuation and SEO Tips! Hello dear Visitors!!! At URL Rate we are not only helping you to evaluate your website or domain but we also care about how to improve your website performance and improve your SEO from simple to complex methods and give you some insights to find your website and SEO's weak point and then use it as a positive tool. Please follow us here basis and our promise is to give the best tips and news about SEO to improve your website performance. If you are planning to target UK audiences with help of Search Engine Services or targeted visitors, then your are in good hands. URLrate.com team is offering special and tailored SEO and traffic packages which are designed and tested extensively and specifically for UK websites. This is a limited offer ONLY for UK webmasters and website owners. Our services are semantic and meets Google and other search engines' guidelines 100%! Website Valuation Snippet for your Website/blog - better traffic! Please contact via contact page and will email you the snippet. Soon the snippet will be added to this section. How your website value or domain name worth is calculated? On The Internet Your Domain Name Is Your ‘Real Estate’. Get It Right The First Time…. This is because if you think about your business or website as a long term investment and reliability, then you need to make sure you have a right and catchy name for it. You will benefit from this simple fact from many points of views. You probably have to pay more for a quality domain name but as long as your intention is to build your business on it, or invest on it, then it worth. Nowadays, it is hard to get a good domain name with a fair price but there are some tools that you can use to monitor expired domain names that are left over to renew for any reason. I am in the process of add a new section to urlrate.com which you can search for expired domain names that are send back to market on daily basis. Basically when a domain expires until it gets back to market by domain companies, it is not visible in when you search normally to look for new domain. But in this prohibition period, you will be able to purchase this expired domains before anyone else get it. I have purchased many premium domain names at this stage of prohibition and have sold them for great price. So at this stage, all is about name, name and name. Having a generic domain name or website brings you organic traffic, reliability and money of course. Please feel free and browse some of Premium Domains at Rare Domains For Sale website. If you own a premium domain name and website with some quality and regular visitors then you are in the luck. This is all about your website performance which it gives the real value and revenue. This is what actually urlrate.com or any other website calculators do for you. Basically there is some important information about any website or domain name available online and by putting these factors together we can have a rough estimation about your website value or worth. If you are planning to buy or sell a website or domain name, then having above estimation can help you to make your decision easier. URLrate.com or any other URL Appraisal or website calculator tool gives all information in one place. Please follow me for next article, next week. Laters!!! If you run an international or multilingual website and serious in getting the best result with your internationalisation then you need to make sure you cover all 8 tips in your website. This helps Search Engines to get a real value of your website and great for International or Local SEO. First one is to make sure the content is translated by highest standard. So when native speaker read it, they don’t laugh at you because of poor grammar. Second reason is the search engines specially Google whom are almost as clever as human being in reading your contents these days and they rank you easier for high quality and unique contents. This is a step to adopt and qualify your product or service with a culture, local desirability and language. The best results come if you start your product, service or business with internationalisation plans (e.g. by creating banners or manuals that are easy to convert or translate to different language…). When localising or internationalising a product, you need to make sure you consider following facts: Currency, Time Zone, gender roles, local colour preferences, age preferences, national holiday, service or product naming convenience, geographic or politic examples or any other important facts that you think can have role in this process. It is recommended to use markups for language localisation or internationalisation rather than style sheets. Never use specific IDs or Classes in your style sheet for internationalisation!!! The main reason for this is that some browser user agent compatibility may skip 'direction' and 'unicode-bidi' and cause issues on your website language performance. As XML does not offer any special internationalisation markup then you can use CSS as there is no other standard option. Avoid using separate CSS files for different directions e.g. styles.css and styles.rtl.css or for any other language. It is highly recommended to use single style sheet. If you have chosen to use one style sheet as above then you need to different way of selecting elements for different directions. To achieve this, you need to use [dir=’rtl’] for modern browsers. :lang() pseudo class is the way to target document of a particular language. Where :lang(fa) pseudo class will fix this. It is important to search for all values that has effect on LTR and RTL directions and mirror them. You need to pay attention for anything that relates to margins, paddings, borders, position related properties, float and text-align. Change text-align: left in LTR to text-align: right in RTL. Tweaking and adjusting the font family or font size for non-latin alphabet depending on the script, font family and font size. By implementing the [dir='rtl'] (or [dir='ltr']) you’re using a selector of higher specificity (CSS specificity). This could cause issues so you should pay extra attention to this and adjust it if needed. I hope this helps you build a better international websites. As Always, please feedback or ask via contact page if you have any more question. Please feel free and use this free tool to find high quality and relevant backlinks. Simply enter your keyword and select the type of blog that you are planning to create backlinks or type of the backlink you are looking for e.g. .gov or .edu. Do not use any silly software to create backlinks!!! Use your common sense and create 5-10 weekly manual and relevant backlinks. Consistency and quality of your content is the key and not astronomic number of backlinks. Make sure you do not over-do backlinks as it may count as spam by Google. Please share and like this page if you enjoy your new tool. Good Luck!!! There is a new tool to review your website and also notes on how to improve your website performance against search engines. Hello Everyone and Happy New Year to everyone! I have added a new tool to URLrate.com which is a great Google SERP Simulator to make your organic lisinng more attractive to achieve high CTR and give the best result for your website SEO. 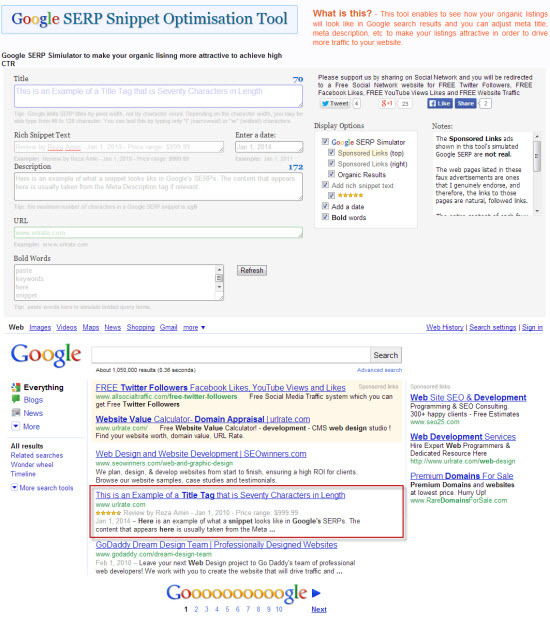 Google SERP Simulator or Google SERP Snippet Optimisation Tool here! 5% Special Discount on ALL traffic services for URLrate visitors. Use code: " Welcome5 " Buy Traffic here!